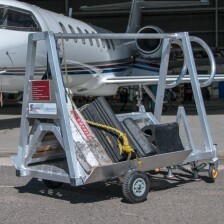 Custom-designed and made by SafeSmart Aviation as part of a full suite of portable access equipment for a client’s newly-acquired Airbus A350 aircraft, this system is made from high-tensile aluminum. Adjustable via a hand winch to suit many variations of similar aircraft, this Main Entry Door Access system allows cabin and maintenance personnel to safely enter the center door whilst the aircraft is away from a jet bridge or airbridge. 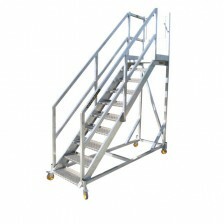 Easily and quickly towable by small ground support vehicles to other aircraft, this stair system also features slip-resistant flooring for added safety in damp conditions.